Content Delivery Network (CDN) brings the static content of your website closer to the global users, using point based servers. In other words, it reduces the distance between the original hosting servers and the destination computers, by placing several connecting or point servers in different parts of the world. These servers then cache some of your website’s elements and distribute them to their ‘nearest local servers’. This technique not only helps in decreasing both page-load times and the bandwidth costs, but also reduces the stress on the original server, while enhancing the customer experience . Incapsula is the best cloud based and robust CDN you can find to improve your site performance. The dynamic caching technology ensures that the content is fresh and the bandwidth consumption is reduced. The page loading time and user experiences are further improved through the content and networking optimizations. It provides unmatchable security to a website and block threats using the integrated DDoS protection and web application security services, while also offering real-time traffic monitoring, failover and load management features. Compared to Akamai, Incapsula has more DDoS data centers & real time cache updates via secondary level caching on SSDs. Compared to Cloudfare, Incapsula provides stronger DDos, real time cache updates via secondary level caching on SSDs, is faster becuase it serves ached resources directly from physical memory. Cloudflare is a highly reliable CDN service provider for protecting your website and boosting its performance even under Free plans. It has a global presence with 115 data centers spread across North and South America , Europe, Asia-Pacific, Australia, Africa, Middle East etc. Cloudflare uses ‘Anycast’ to create extremely resilient network. The built-in load balancing and automatic failover features help to maintain the service deliverability, despite losing 50% of the network. The advanced DDoS protection offered – is one of the largest in the world, and is capable of handling all kind of attacks that are targeted towards UDP and ICMP protocols, SYN/ACK, DNS amplification as well as Layer 7 attacks. And with the help of it’s real-time analytics, you can also monitor and block threats and search engine crawlers – that usually make up for 20% – 50% of the total traffic! 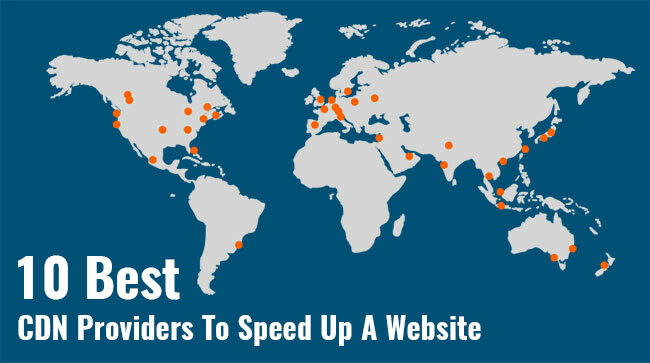 In comparison to Cloudfare, Incapsula provides a better website security, DDos protection & is a faster CDN..
MaxCDN is one of the popular Content Delivery Networks in the world as their servers are strategically placed across 90 countries. The SSD loaded servers are optimized to provide excellent image acceleration and page loading speed that improves the overall performance of a website. The inbuilt SSL feature protects your site in real-time, while the secured tokens and two-step authentication help in locking your content and securing your account. The control panel enables you to change the rules of how your content should be cached on each location. MaxCDN is compatible with all the popular content management systems like Magento, WordPress, Drupal etc, while the ‘REST API’ allows integrations with users, zones, and other resources into your applications. 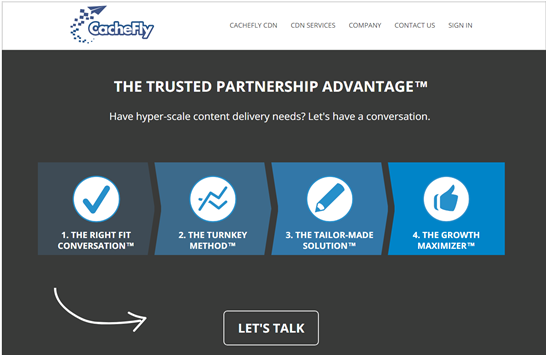 Cachefly offers an extensive range of CDN services and excellent performance with low error rates. It has 40 points of presence across the world and each point is highly reliable in bringing the rich media content closer to their nearest users. It expedites the delivery of static objects up to ten times, and provides gzip compression that caters to the faster accessibility without leaving a footprint. The md5-shared secret system enables you to create several security controls for your website using Time-stamp, IP address, and Return URL. Other features include two-factor authentication, real-time reporting & analytics from Paessler, CloudHarmony and Cedexis, on-demand bandwidth with no risk to performance degradation or timeouts, and much more. Rackspace offers solid uptime (close to 99.99%) and great security features that is probably the best amongst others. They use RAID-10 SSD with advanced backup technology and unique protocol that automatically move and adjust themselves in case of a potential threat. This ensures absolutely zero downtime, increased reliability and data security. Rackspace also offers three-layer scanning to protect your communications and businesses, along with pay-as-you-go file storage options for hosting large files, images or other static content. It is more apt for large businesses with complex websites and complex hostings. KeyCDN is another popular and feature-loaded CDN service that provides advanced technology and optimizations at a much affordable price – even if the bandwidth is increased. They use 100% SSD-optimized servers for low latency, and all of their points-of-presence are located in premium SSAE 16-compliant data centers such as Coresite, Digital Realty, Equinix and Softlayer. Other KeyCDN features include the intuitive dashboard; HTTP/2 for faster delivery; GZip compression for faster data accessibility; real time reportings; extensive security (with DDoS protection, shared or custom SSL, secure token etc); origin shield and much more. KeyCDN supports all platforms such as Drupal, vBulletin, Magento, Joomla, WordPress etc. Akamai is a cloud based optimization platform having a strong infrastructure to speed up sites, networks and connections. Akamai’s intelligent platform offers several features that thoroughly improve the site performance. For instance, the Dynamic Site Delivery instantly scales the delivery of websites globally, even during the peak demand. The real-time visualization provides technical insights to global regions that are susceptible to web attack traffic, and helps in identifying the cities with slowest web connections or highest traffic density. Though Akamai offers the most reliable CDN, it uses DNS based lookups that tend to make it slightly slower as compared to Anycast. Despite that, it is more popular within larger enterprises with high revenue and high market cap, such as Adobe or Nintendo. Amazon CloudFront integrates with all the Amazon Web Services and delivers content, applications and APIs – with low latency and higher transfer speeds. It offers high availability and scalability across 21 countries through 77 edge locations and 11 regional edge cache locations that help in maintaining high-cache hit ratios. It also allows you to use your own domain name and SSL certificate at no additional cost, and provides a complete secure environment to host any website. Other features include live video streaming, support for dynamic and personalised content, as well as the geo-restrictions that allow you to restrict your content within a country. jsDelivr uses the unique multi-CDN load balancing – for delivering best possible uptime and performance, especially in cases where if one server goes down, the traffic can be re-directed to the other functioning servers. It also uses Cedexis for getting a real time insight to the performance of a website over their network, while the two synthetic uptime monitors help in detecting early downtown and instant failover. It even has a bot called ‘libgrabber’ that periodically scans the hosted projects for any new changes/versions and keeps them up-to-date. Microsoft Azure CDN has an impressive infrastructure that helps you reduce load times, save bandwidth and increase responsiveness for an assortment of websites that are heavily dealing in streaming media, gaming softwares or firmware updates etc. It is easy-to-use and rich with features that provide robust security and advanced real time analytics along with acceleration of any content on any device. It can even cloud hosts to support ASP.NET. 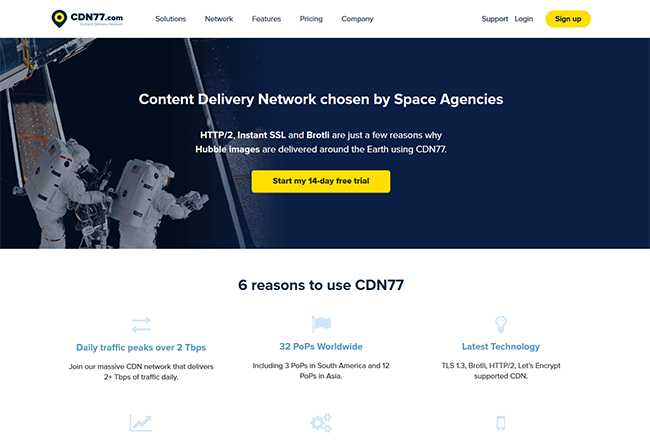 CDN77 is known as an innovation frontrunner for deploying the newest features as soon as possible – such as HTTP/2, Brotli compression or TLS 1.3. They offer competitive prices in both pay-as-you-go and monthly plan pricing plans. Global coverage of SSD-based data centers with total of more than 5 Tbps network capacity ensures smooth and fast delivery. Customers especially like their 24/7 live support, easy setup and intuitive dashboard. CDN77 supports all major CMS like WordPress, Drupal, Magento, PrestaShop, Opencart, Joomla! or SocialEngine. You can try their 14-day free trial to get to know their service better.